Let the wild list-making rumpus start! Maurice Sendak, author of wildly influential, deeply moody children’s books — including, most notably,1963’s Where the Wild Things Are — died this morning in Connecticut at age 83. In the nearly 50 years since its publication, the book, which takes a characteristically dark view of kids’ imaginations and independence, has had a formative effect on artists of all kinds. 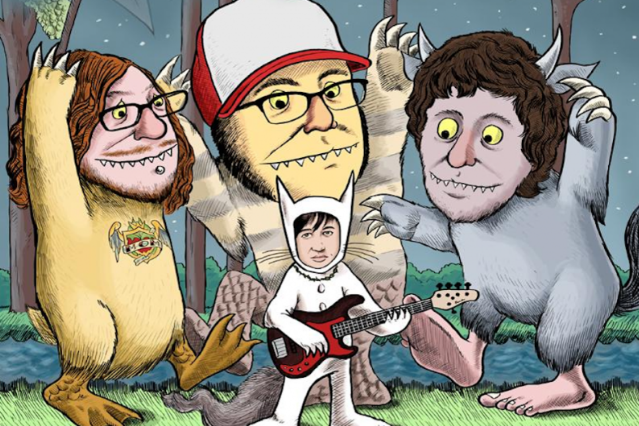 Probably no surprise that early-aughts heart-on-their-hoodie-sleeves emo acts identified with Where the Wild Things Are as a totem of lost childhood. So certainly no surprise that Fall Out Boy, of all bands would incorporate the imagery for their 2007 Young Wild Things tour with Gym Class Heroes and Plain White Ts. (“Where the Wild Things Are is a great narrative,” Wentz told MTV in 2007. “It encapsulates pretty much every FOB song ever written: You know, tantrums and monster islands and all. And it’s kind of a takeoff on the idea of young wild things wearing Dior ankle-monitoring bracelets.” And definitelyno surprise that all this borderline copyright infringement caught the attention of Sendak’s lawyers, who had their way with the prospective merch-table offerings; the band subsequently apologized, as any chastened man-children should. Six years after mining childhood nightmares for the biggest hit of their career, this track from 1997’s Re-Load uses Sendak’s story as a springboard for more bedtime boogeymen. In 2009, fellow shredder demigod Steve Vai released an album called Where the Wild Things Are, further cementing the eternal relationship between guitars that go waaaaaah and things that go bump in the night. It was hard to be more famous than Carole King was in 1975. During the Nixon and Ford administrations, she released the genre-defining Tapestry in 1971, the best-selling album until Thriller, then three more albums that went at least gold. She was the very definition of the self-actualized singer-songwriter, so maybe it was perfect that she teamed up with Sendak for the children’s musical Really Rosie about an extremely self-confident little girl in Brooklyn and her pals. (Then again, it was also a bit like Mo Willems making a musical with Jay-Z which, come on, would be amazing). Based on his tiny books Chicken Soup with Rice, Pierre, One was Johnny, Alligators All Around and the full-sized The Sign on Rosie’s Door, Really Rosie will be performed by summer camps and elementary schools from now until the universe collapses, but it’s also a very interesting hunk of ’70s cool. Rosie is a blast, the sort of fearless, star-struck gal that only King and Sendak could have come up with. Rosie’s ambition is pure hip-hop, dreaming of stardom from her Brooklyn stoop, making up stories to entertain her pals. King’s songs were many kids first exposure to that sort of craft and you can bet a stack of Bratmoble singles that most riot grrls were well familiar with Rosie’s bravado. Perhaps the most understated of Sendak tributes, the classical-pop Quebecois Patrick Watson’s quiet “Where the Wild Things Are” is featured on his 2009 album, Wooden Arms. The track, he told Chart Attack, was written and recorded in an attempt to get Spike Jonze’s attention when Watson discovered the director would be bringing the book to the big screen. “I made the song as a demo for [Jonze] to see if he could use it for the score,” Watson said in 2009. “I had to try something since I grew up with the book. It was my favorite book ever. I had done it myself, more as a composer, and at the end when we were putting the album together, everyone liked the song.” Despite its cinematic nature, however, it was probably deemed a bit too orchestral for the flick’s raucousness (though not in the opinion of the fan who made the above video), and Jonze ignored the offer. The film hit theaters six months after Watson’s Arms was released.